Who was Edith Durham? It’s a question I am asked more often than I would like, because this redoubtable woman deserves to be more of a household name. But the answer is never easy. When she died, in 1944, the British Artists’ Yearbook, The Year’s Art published a brief notice and their summary of her was as a ‘world traveller and accomplished artist’. Indeed, Edith Durham’s first public identity was as an artist, as she exhibited her watercolours at the Royal Academy and contributed illustrations to the Cambridge Natural History volume on amphibia and reptiles. However, at the end of her life when summing herself up in a note for the family tree she produced for her great-nephews, she didn’t mention her art, and instead labeled herself as ‘author and traveller.’ She certainly deserves to be known as both – she wrote seven books, all on Balkan subjects, as well as travelling extensively in the Balkans, most notoriously into the highlands of Albania where no British woman had ever been. But there’s more to Edith Durham than this; when as part of a vox pop the Albanian programme, Fiks fare asked a Tirana school child who Edith Durham was, the child answered ‘our headteacher’. That was certainly not a correct answer, but the reason for the child’s confusion is significant – he was a pupil at the Edith Durham School in Albania. There is more than one school with Edith Durham’s name (I know of one in Kosovo as well as the one in Tirana) and many roads named after her (I’ve seen streets in Korca, Shkodra, Fushe Kosova, Tirana and Prishtina) as well as a stamp in her honour, issued by the Republic of Kosovo, and a commemorative plaque high in the Accursed Mountains that form the border of Kosovo with Albania. Why does this woman have such an enduring legacy in a country that is not even her homeland? No other contributor to the Cambridge Natural History volume on amphibian and reptiles is thus respected, and even the publication of seven books doesn’t qualify for you for such national adoration. But as well as being an author, traveller and artist, Edith Durham was a great friend to the peoples of the Balkans. Her journeys in South East Europe were not just for recording - with an artist’s eye for detail, objective and never sentimental – what she saw but also for giving hands-on aid when it was needed from 1903 to 1914. There must be tens of thousands, if not hundreds of thousands of people alive in the Balkans today only because Edith Durham saved their great grandfather or their great-great-grandmother. This is the main reason for her enormous popularity, added to among the Albanians of Albania and Kosovo by her dedication after her permanent return to the UK from the Balkans to lobbying for the Albanian cause. 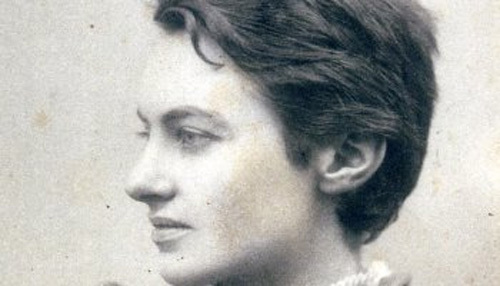 These multiple identities pose a challenge for anyone wanting to write a book about Edith Durham, watercolourist, author, traveller, humanitarian and heroine to the Albanians. My own book, Edith and I; on the trail of an Edwardian traveller in Kosovo, which came out last year, gets filed variously under ‘Biography’ and ‘Travel’ and is a self-confessed partial view of Edith Durham through her time in Kosovo and my own. This year, Marcus Tanner produced his book on Edith Durham entitled Albania’s Mountain Queen; Edith Durham and the Balkans, which could likewise be filed under Political History as much as Biography. Sometimes (as in Chapter 1, which passes 18 pages with only 5 loose references to Edith Durham as a hook on which to hang a skillfully-sketched summary of the political history of Croatia, Bosnia, Albania, Bulgaria, Montenegro and Macedonia) there seems to be hardly any Durham in it at all. At other times there is hardly any Albania in it (given the structure around her wider Balkan journeys, only five of the eleven chapters are mainly focused on the country). This makes Tanner’s book a possibly frustrating read for anyone wanting to concentrate on the Mountain Queen or the Albania where she was so crowned by the people. However, what the book does achieve is a lively, informed and readable wider history of the Balkans during the twenty or so key years that Edith Durham was active there (starting in 1900). In this wider history, more than in the sections focusing on Durham, Tanner goes beyond the primary sources of her letters, diaries and published accounts and uses a range of material to explain and contextualize the countries of the Balkans, and Western Europe’s relationship with each of them – from Oscar Wilde on Bulgaria, and Tennyson on Montenegro, to GK Chesterton’s essay to celebrate ‘Kossovo Day’ in 1916. In between, the details drawn from Durham’s writing on her humanitarian work is a welcome response to the Albanian school child who knew her name but didn’t know what she’d done. Admiration for this least-known of Durham’s personae can only grow, reading Tanner’s account which draws on Durham’s vivid tales of refugee work dodging roaming wild dogs, and the realities and culture clashes of running a hospital with untrained staff wedded to superstition. But what the book adds to her reputation as an aid worker it detracts from her as anthropologist. Her contribution to this field was possibly what brought her the widest respect in her lifetime, recognized by Durham becoming Vice President of the Royal Anthropological Institute (the first woman to hold the post). Tanner’s treatment of her interest in anthropology verges on sneering (‘Durham had to confront the fact that people who wore fascinating, antique-looking costumes – the same women who looked charming in photographs and in water colours, leaning against wells and holding pitchers of water – could be infuriating to deal with’) and doesn’t give credit for the objectivity with which Durham had treated the individuals who feature in her anthropological accounts. To say ‘Durham found peasant amulets fascinating. She felt less enamoured with them once she discovered that the Macedonians placed more faith in the healing power of their amulets than they did in her western medicines’ suggests a disconnect between amulets and science, and disregards Durham’s significant contributions to the science of amulets. Tanner’s book prefers to privilege politics over folklore, missing Durham’s own belief that folklore is politics (and indeed that often in the Balkans, politics is folklore). This is not the Durham that we want to celebrate, and happily not the woman who stays with us after reading Tanner’s book – instead we remember the details he shares from her writing – the eccentric playing her phonograph in a Sarajevo café, or the practical Moneypenny dealing with the details necessary to bring off a successful Montenegrin exhibition at Earl’s Court in London (the Montenegrin Interior Minister ‘came to London but almost failed to attend the opening of the exhibition after complaining that he didn’t have the right kind of shirt. As a result, Durham had to rush out and buy one for him herself’). Edith Durham – in her personae of artist, writer, aid worker, anthropologist and even as lobbyist – was and is an inspiration, and it is a cause for celebration that through this new book her story is being told more widely.